TBILISI, DFWatch–Georgian Energy Minister Kakhi Kaladze on Tuesday sought to downplay criticism against his call for increasing the import of Russian natural gas, explaining that the extra supplies from Gazprom will be necessary only in a transition period until Azerbaijan’s Shah-Deniz field begins having an impact in 2019. After meeting with representatives of Russian Gazprom, the world’s largest extractor of natural gas, in September, Kakhi Kaladze said that Georgia is considering additional sources of gas apart from Azerbaijan, which is currently Georgia’s main supplier. He said that Armenia is negotiating with Gazprom about increasing its gas import, and since Georgia is a transit country for those supplies, it is looking forward to getting more benefits from the transfer of gas to Armenia. But he also said that the government is thinking of allowing private companies to buy gas from Russia. Kaladze’s statement resulted in accusations that the government is endangering the country’s energy independence. Apart from such criticism, hundreds of people gathered on Saturday at the government office protesting against the negotiations with Gazprom. On Tuesday, Kaladze said negotiations with the gas company will end in December, but he explained that negotiations about gas transit are held every year. This year, the negotiations began in August, and agreement must be signed in December. Armenia wants to increase the gas flow from Russia to supply new thermal power stations, he explained, and the increased transit of gas through Georgia will lead to an expectation of additional gas also to Georgia, as part of that arrangement. Georgia currently receives about 12 percent of its gas supplies from the Gazprom pipeline that runs through the country, to Armenia. The energy minister said at a press conference that there will soon be another meeting with Gazprom, after which more details will become known. Another topic of the negotiations, he said, is that private companies will be allowed to buy gas for advantageous prices if possible and import gas from Russia. There is still no information about the price level. 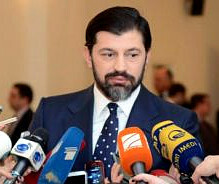 At the end of the press conference, Kaladze said that the coming years will be problematic for Georgia until the Shah-Deniz project brings more gas to the country. Georgia is investing in an Azerbaijani project to expand a pipeline that runs through the South Caucasus and will bring natural gas to Turkey.